Giving up my Airhead isn’t easy. That feeling when you’re out on your SUP board, paddling across the blue water, there is nothing that beats it. What makes standup paddleboarding even easier is using an inflatable paddleboard from Airhead SUP. And now we’re giving it away! I was sceptical about inflatables, unsure if they’d be firm enough to stand up on, let alone do yoga. Unsure if they’d offer the same stability on moving water. And worried about having to spend hours pumping it up on a hot beach. Well, all concerns were put aside as soon as I unwrapped my beautiful new Airhead Fit 1032 iSUP that comes in a zippered mesh carry bag. 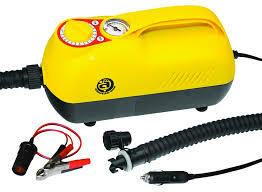 The Airhead Super High Pressure Air Pump is battery operated, and plugs directly into your car for quick and complete inflation. Also available is the Airhead Super High Pressure Hand Pump which is equally great and works fast to complete the job if needed. With my paddle in hand, and the Airhead SUP Crunchy Board Leash connecting me to my board I was off. The lake was pristine that day, flat as glass and blue as the Caribbean. With the warmth of the sunshine bouncing off my shoulders I knew I needed to do some yoga. This board held up to tonnes of fitness fun. It was completely stable as I moved between asanas. The length and width of the Airhead Fit 1032 iSUP allows for a complete Surya Namaskar. Extending into a full plank was a piece of cake, with plenty of room to move around on this 10’6” x 32”board. And when the board is inflated to its optimal level, you have full and complete stability, allowing you to focus on your poses and yourself. The top of the board is perfectly designed with a built-in traction pad to inhibit slippage, and feels super secure beneath your feet. The durability and portability of Airhead inflatable SUP boards make them a gift to paddleboarders everywhere. Imagine summer road trips with your paddleboard tucked neatly in the trunk of your car. Imagine flying to the Bahamas with your SUP in your suitcase. Imagine walking down the road to the beach for a SUP session with friends. At only 27 lbs. this board is light enough for travel fun anywhere your adventurous heart desires. We all tried out the board before we let our fitness model get out there, and what a great day we had, out in the sunshine on a rugged Canadian beach. In fact, there were a few skirmishes, and we had to time our usage in order to keep things fair – hashtag grown women acting like airheads. And guess who got the most paddle time out there on our Airhead. The Airhead Fit 1032 iSUP is definitely a board to fight over. It glides along waterways for touring, is great for relaxing with the anchor in place, and handles our fitness adventures adeptly. The hardest part is letting it go, but we want you to experience the joy of being out there on your very own Airhead standup paddleboard. So we are giving away this very board and all the accessories that come with it to one lucky reader. 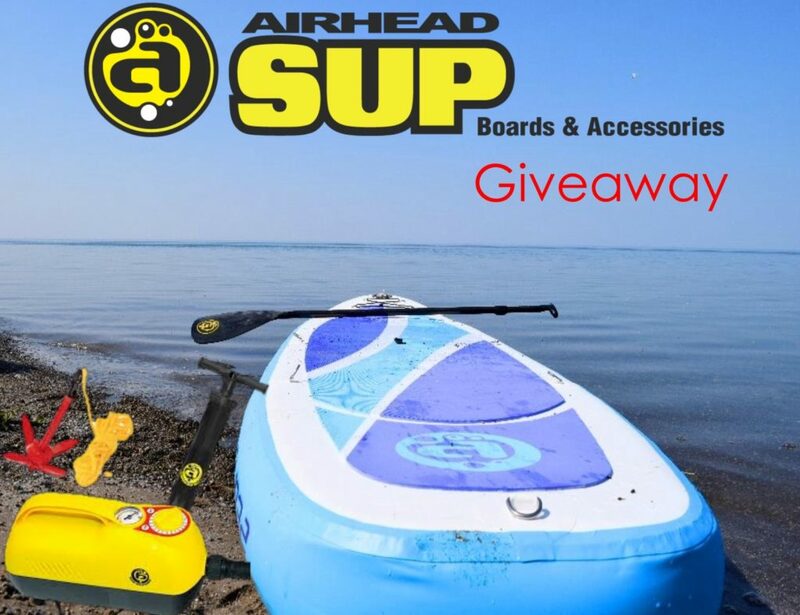 The total value of this prize package is US $1,488.96 and it could be yours absolutely free thanks to the generosity of Airhead SUP! Comment below – What is your favourite water related activity? Giveaway contest is open to those with a USA or Canadian shipping address. Giveaway contest begins at time of publication Jun 7, 2016 and ends Jun 21, 2016 11:50pm EST. Winner(s) will be randomly chosen and notified by email on June 30, 2016. Winner(s) must reply to notification email by July 14, 2016 11:50pm EST. I enjoy boating and would love to try paddleboarding! Thanks for the chance at this great prize! Water skiing is my favorite! I love just about any activity on and in the water. I’ve been dreaming about owning a paddle board!! This one looks amazing and so easy to transport. I guess if I had to pick a favourite water activity it would be swimming. It’s about as close as I can get to and in the water. My goal is to eventually live directly on a lake front or beach. I can think of nothing better than waking up next to the water, swimming daily and having sun downers watching the sunset over the water. I love the water! Kayaking is one of my favourite water activities! I am a yoga instructor and wound love to have my own SUP board to practice yoga on the water!?? Paddle boarding is my favorite place to be… It’s calming and challenging…. SUP Yoga is hands down my favourite water activity! This would be absolutely amazing to win! My favorite water activity is canoeing. It’s so peaceful. Swimming. I’m like a mermaid. I love to be in and under the water. My favorite is kayaking. But I’ve taken a few SUP yoga classes and fell in love ❤️? I enjoy water skiing, water tubing and canoeing. Don’t have a SUP board but would soOoo love to win and include this too!! ? Thanks for the chance!! Such an awesome giveaway!! SUP’ing in the Channel Islands! My husband and our 2 daughters absolutely love being in the water! Our favorite activity is swimming and kayaking, we would love to try other things! Love inflatables for taking on our boat to the islands. So much safer than tying up the large bulky ones to our bow. My favorite activity on the water wow that is hard. anything to do with water i find soothing and relaxing. Look at these all the time with a wish to own my own. wow what a relaxing enjoyable time it would be. I enjoy a lazy river as I am not a swimmer! I love being in the water, doesnt matter if its swimming, water skiing, tubing..I love it all! Luckily there is beautiful lakes & beaches where I live so I am looking forward to a great summer in the water! Thank you for a chance to win this great prize!! I love Kayaking, and my family loves going tubing.. Thanks for the wonderful giveaway! Favourite summer activity is anything that involves the water!! I love water volleyball. I personally think it is a lot of fun. My favourite water related activity is swimming!!!! I love being on the water! There is something about it that is so relaxing!!! I love swimming and fishing! Kayaking is for me. I have been paddle-boarding and enjoy that also. Thanks for the giveaway. Water aerobics, swimming and fishing. My favorite water related activity is going out in a canoe by myself in the early morning just listening to the sounds of the area. That’s a tough one! Love so many but if I have to pick just one, it’s scuba diving! Fishing and boating are my favorites but I do love many more!!! My favorite water activity is wake boarding. Making great memories with the family having fun in the sun. I love all kinds of water sports but mostly, I love to swim. We live in AZ so we live in the water in the summer, love anything in the water! My favorite water-related activity is rowing! water sking, or tubing, water sking..hell anything on water!!! I love kayaking, but would really love to give paddleboarding a try too! Boating is my favorite water activity! Snorkeling and swimming- preferably in the Caribbean- retired- with a ton of money :). Well, one can dream! i love to play in the water with the kids, any activity and when I can I go fishing. My favorite water activity is Swimming. Swimming and watching the grandkids paddleboard. My waterkids would soOoo love this too! Always wanted a SUP and this would be a perfect addition to add to our water activities. Crossing fingers and toes..? Thanks for the chance. Love swimming and paddleboarding at Lake Tahoe. So relaxing. swimming hands down 😉 <3 thx!!!!!!!!!! My hubby & I love to kayak! I love to jetski. Also tubing and swimming. Boating also. I love to go boating and fishing from the boat. Sweet!love a little fun in the sun and water! we love to go jet skiing and tubing!!! Mosty tubing but would love to try paddle boarding ! I love all water activities but I tried stand up paddleboarding a couple of years ago and that instantly became my favorite. It’s so much fun! I would love to win a paddleboard of my own. Fishing is my favorite water activity! Summers on the Bay of Fundy… I like to swim (yes, its cold) and I like to go boating. This would be a fun new activity for me and the family. My favorite water activity is going tubing or water skiing. Anything is better on water. I enjoy fishing, kayaking, and just relaxing on the water. I absolutely love to kayak! It is a challenging water sport, yet incredibly fun. I especially enjoy kayaking along rivers and with friends. Paddleboarding is very interesting, I would love to try it! My favorite water activity is canoing or kayaking. The paddle board looks like it would be a lot of fun. I really love to swim. Love kayaking and canoeing, love the water. I like swimming and would love to try paddleboarding. My favorite water activity is water skiiing! always love to be near the water especially in the summer when it’s hot and sunny out! Swimming is my fave water activity , but I was saying to my friend how badly I want to try paddle boarding when we go down to the Caribbean , looks so fun ! I love water skiing on Rideau lake! We LOVE to fish at little ponds. This would just be amazing. Swimming is my favorite water activity. Whitewater kayaking! Now I’m wanting to try a SUP though. Swimming and paddle-boating. I only say that because I’m too scared to try my BF’s paddleboard because I don’t want to pop it! If I have my own I could learn with my own board without being scared of damaging it! I love SUPing here in Tennessee but only have one problem… I don’t own a SUP! I love a quiet canoe ride on the still water. This is FABULOUS! I love to paddle board! i love swimming! i live steps from one of the largest fresh water lakes in the world, and I spend a lot of my summer in it! A paddleboard would be a great new way to get out on the water! My favourite sport is snorkelling but the more I try SUP, the more I think it could soon be #1. Fingers crossed I’ll be able to more of it soon. I am all about getting out on the lake kayaking. I know I would love paddle boating just as much. I was born in the maritime and love everything to do with the water. So far my favourite activity is simply swimming but I would like to get into paddle boarding, canoeing and kayaking. Water skiing is my passion! I’m surrounded by the oceans, all water sports. I Absolutely LOVE swimming and snorkelling! 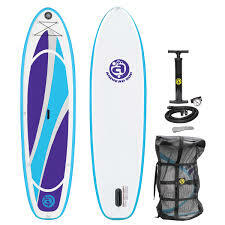 I always wanted to have my own SUP to go paddle boarding and so I would love to win this! The only water activity that I’m really interested in is swimming. I just like being on the water in any way! MY FAVORITE WATER ACTIVITY IS JUST RELAXING ON A BOAT WITH THE MUSIC PLAYING AND A BEER IN MY HAND , CRUISING THE LAKE . I love to just float and let the curretn take me whereever. Then swim back! 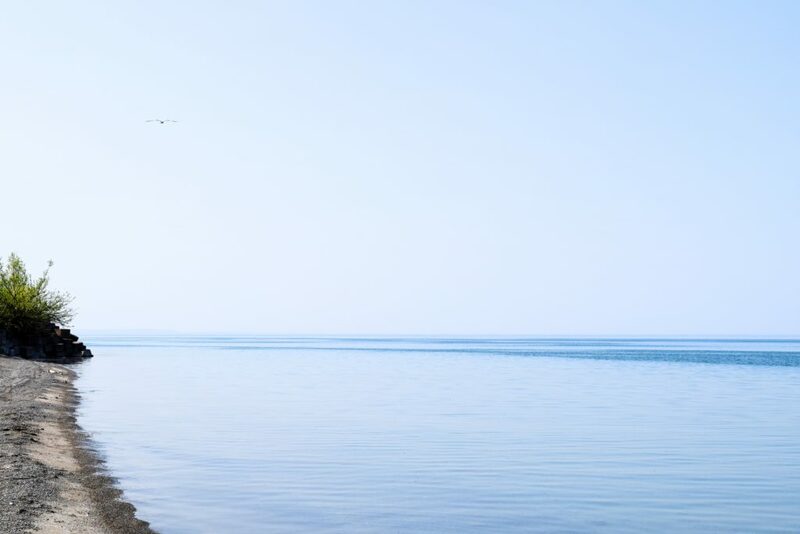 My favorite water activity is to swim from pole to pole in Lake Michigan at the state park. My favourite water activity is canoeing. I would love to try stand up paddling boarding too – looks like fun! My favorite water related activity would be Wake Boarding for sure. I love to swim and kayak. Shared on Facebook. I love to go fishing, but my favorite activity is watching our grandchildren surf and paddleboard. We love to take the boat out and stop for lunch or dinner on the weekends. Love to wake board and kayak! My favorite activity would definately be swimming. Thanks for the chance! Swimming would like to try the paddle board. I love to swim and float around in the water, paddleboarding looks like it is fun and my granddaughter ( 12 years old ) loves doing it! I like kayaking and canoeing equally. My favourite water sport is kayaking. I think it’s fun to kayak down a river with friends. SUP-ing is my absolutely favourite. It’s so relaxing! I love any water related activity, especially swimming. Would love to try paddleboarding!!! There are so many water sports but I guess swimming would be my favorite as I have been swimming almost as long as I remember. i love floating in a blowup boat with a Smirnoff Ice by my side 🙂 summer fun !!! Floating lazily with my daughter – hopefully on this SUP! My favourite water activity is swimming with my kids in my dad’s pool. My favorite is body surfing in the ocean. It requires a certain type of wave for best results, but when it happens, it feels like flying. I love paddleboating with my husband, but tried SUP once before, and loved it almost as much! I love going wakeboarding!! nothing like it. and I already like you on Facebook. I really enjoy being on a pontoon boat and just relaxing on deck and enjoying the scenery. I like to canoe around the lake. My favourite water activity is snorkeling. anything involving floating on a lake in the sun! At the moment my favourite water activity is kayaking. Going kayakings is my favorite water activity! Tubing the river with friends is the best. Actually, it is paddleboarding! I’d love to win this board so my husband can join me. My favorite water related activity would have to be fishing. I love white water rafting!! My favorite water related activity would have to be boating. I love being in the water but have not been exposed to many water activities where I am. I went on a boat when I was a little girl and we went swimming in the middle of the river and I LOVED it. Kayaking is awesome but paddle boarding is a close second! I would also say tubing the river. I love swimming and hanging out in the Pool! Stabd up paddle boarding of course! Holy Batman, my fave: swimming. Free. Pick me, pick me! Your next winner!!! Show me the money!!! It would be a dream come true and means more to me than anyone else to win. 🙁 Starving artist here desperately needs the prize boat to have fun and feel alive and inspired again. A life changing experience. Top of my bucket list. Dear Santa: I’ve been nice. My X-Mas wish this year is to win this contest. Thank you for the awesomeness, the contest, and generosity. I really enjoy snorkleing but to do it right you need to be in Hawaii. Boogie boarding at the beach is my favorite! I love kayaking on the lake. Wakeboarding and floating around on an air mattress! While there are many water-related activities I enjoy I think my favorite out of them all is kayaking. There’s nothing like getting in your kayak and gliding across that water, especially if you get up early enough that it’s silent and still. Thank you for this AMAZING opportunity! I liked water skiing til I broke my ankle and so can no longer do this because of potential breaking again. Now I love to kayak. BOATING AND FISHING. BUT MY 44 YEAR OLD SON LOVES PADDLE BOARDING. My Favorite water activity is Dragon boating! I love paddle boarding near my home! My favourite it boating with the kiddos! I love when we are all out on the water together! I feel in love with paddleboarding last winter when I tried it for the first time in Key West. It’s now my favorite water activity! I enjoy my own SUP board and bought one for my son…but it is so heavy! A blow up would be perfect! Snorkelling and swimming in general is always a good time. My family lives at the lake during the summer months and we love everything from tubing, swimming, canoeing, kayaking. I haven’t been lucky enough to try a paddleboard, but it really looks fun !!!! Paddling and fishing are my favorite water activities, but I would LOVE to start SUPing!! We love kayaking,tubing,boating,swimming,jet skiing,really anything water related! I am SERIOUSLY so so excited about this give away!!!! I am looking daily, several times a day, at paddle boards, and I can’t even tell you how exponentially excited I would be to win this one!!! I have my life belt, and life jacket for Lady Bonnie, a wheeled cart if I need it to get the board to the water, (probably not since an inflatable), a water proof cam, and will use, use, and USE this board! And I will feature it repeatedly on my blog, and social media!! PICK ME!!!! Please? Pretty, pretty please? PPPPLLLLEEEAAASSSSEEEE!! I have tried almost all water sports possible but this would be a first.Looks like tons of work and an amazing workout at the same time.Would love to try this fun experience for the first time.Thanks so much for the amazing giveaway,and the chance to try something new. Honestly it’s so basic, but I really just love swimming. I’ve tried canoeing, kayaking, tubing, but nothing to me is as nice as just floating around on your own. Water baby since birth I suppose haha. Kayaking is my favourite water activity, but I’ve been dying to try SUP-ing! I would love to try paddle boarding! It always looks like so much fun, but I don’t have a paddle board. My favorite activity however is snorkeling! Swimming in the pool, in a lake, at the beach or down the river is my favorite water activity. I love swimming in warm lakes. I love to body surf! And SUP too. My favorite water activity is tubing! Kayaking is a love for sure! Would love to try paddle boarding! I love swimming, kayaking and canoeing. I like to play with my dogs in the pool. I absolute love surfing, but I’m super stoked to try my talents out at Paddle boarding!? After trying stand up paddleboarding recently it has become my favourite water sport. The wonderful core workout provided by the sport along with being out on the water is such a great combination. My favorite activity is swimming! I like snorkeling and swimming. Water skiing! So much fun! Swimmer. This looks like fun. I love kayaking but have been really wanting to try paddleboarding! I like swimming and tubing. I would love to try the inflatable paddleboard from Airhead SUP. Great prize, thanks for the chance! I like to Kayak whenever I can! Wakeboarding is my favorite activity. My favorite water sport is kayaking. Boating is my favorite water sport! I love to Stand up Paddleboard and Kayak. I PREFER FISHING AND BOATING BUT MY 44 YEAR OLD SON LOVES PADDLEBOARDING. SO LET’S WIN HIM ONE!! Fishing. Does that count as a water activity? Swimming. Pulling the kids tubing is my favorite water activity! I love fishing. Thank you. My favorite water activity is fishing. Snorkeling in Hawaii is my favorite. swimming, boating, but we recently discovered paddle boarding and love it! Kayaking is my favourite but that may quickly change if I win a paddleboard!!! Good luck to all and thanks for the chance! thanks for the chance such an awesome giveaway!!!! Growing up on the Ocean and than moving to the city for a big girl job was the hardest thing. When I have the chance to escapes the inner city, I always try to run away to the ocean, the sounds of the waves and the feel of the sun on your skin and scent of the ocean with the taste of the salt. I miss being able to take an evening surf on Martinique Beach and watching the sun set fall below the waves. Well, waterskiing is my favourite watersport, but I have been wanting to try this. My current favorite water activity is wake boarding but I have a feeling that may change. 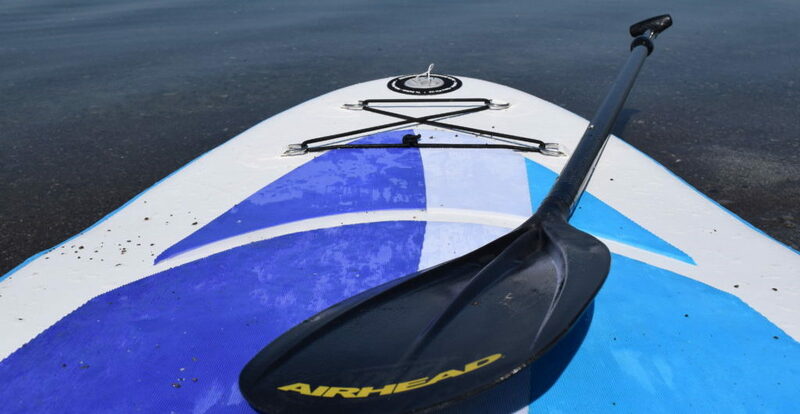 I can’t wait to try an Airhead SUP Paddleboard it looks like so much fun and such a great exercise tool. My favourite water activity is Scuba diving! I love SUP and sup yoga already. Would love to try this board! I love swimming but this looks awesom! Everything in or on water is great – we try to do it all! I love swiming on the Mediterranean Sea ? But my dream is practice yoga on the sup! This is a great opportunity ! Thank you ? I love to go swimming and fishing! I shared on my facebook and like the page! Wow! Such an awesome prize! Thanks for this opportunity! I enjoy kayaking but have been wanting to try paddle boarding. We love to play frisbee in the water. Practicing yoga on a sup board is like having your very own little island to retreat too. As you get distance on all cares and concerns what comes with the space, the time on the ocean breathing salty healing air allows you to upgrade your perfection, tune in and connect with a higher vibration ? I drive a vw beetle and the only way I could be independently taking myself off to the lake daily for a perception upgrade would be on a perfect air sup … Good luck abundance is loaded with this comment.. I enjoy swimming in a pool and fishing in a lake. I want to win a paddleboard! My family and I love all types of water sports and this would be totally awesome to win so we can add it!! Crossing yogi fingers and toes!! Thanks for the chance!!???? Last summer I fell in love with paddleboarding and especially practising yoga on the SUP! Easily my favourite water activity. I love paddleboarding and practising yoga on a SUP! My favorite water activities are swimming, canoeing and body surfing big waves!! I also tweeted this awesome giveaway! I also pinned this awesome giveaway! Thank you so much for offering this giveaway!! I truly enjoy surfing more than all other water related activities. I truly enjoy playing water-polo. I like boating and would love to win this prize and use it. The smiles on my boys while they are tubing. I like being on the water and always looking for new ideas this would be wonderful. My face water activity is SUP and I would love my own!!! My favorite water sport is scuba diving. I love kayaking. Just did it for the first time last year and I am hooked. Paddleboard is something I would love to try. I love boating and paddleboarding! We like to go water skiing on warm sunny days. I like to swim laps. After thinking it over, my favorite water activity is bathing in calm fresh water! There’s no better feeling than shavasana on the water! I love swimming and boating! I enjoy just laying back and enjoying the water, I have never really had the opportunity to try too many water activities as an adult. It has been about 18 years since I have been on a boat. I love to Boogie Board! My favorite water activity is scuba diving! Boating is my favorite but I would love to try paddleboarding! I love water tubing! We have so much fun when we go camping! I love water aerobics, swimming, paddleboard and I would love to try water yoga! I love surfing. My father taught me how to when i was 12 years old. Im 35 now and i still go. He passed some time ago. I still go out and think of him all the time. Today is fathers day..its a rough one this year. If I had to pick one thing it would probably be boogie boarding. I love the feeling of riding a wave and the beach that continues to draw me has amazing waves almost all year. It is one of my favorite places to watch the sunset. In the past it was swimming but this year I want to try paddleboarding and kayaking! Surfing is my favorite water related activity. I also love to take my dogs out in the kayak. I love to kayak, but have recently tried stand up paddle boarding at a rental place, I love it! Swimming is my absolute fave! I really like to paddle boat. I’d have to say my favorite water related activity is water skiing…although canoeing and paddle boarding are right up there too! Swimming & would love to try paddleboarding! My favorite Water activity right now is aqualaties! Thanks for the giveaway, keep up the good work! i love to kayak or large water canoe in whitewater.. but this looks awesome and fun as well! My favorite activity is swimming and fishing! I love to just relax on a boat! I am basically a fish…. I love paddleboarding and I swim for my school! Snorkeling is my favorite water activity. I love jet skiing! So much fun! What a fantastic giveaway. I love to SUP. It is totally my fav water activity. Never tried an inflatable before would love to win this! Water skiing is our favorite activity. Wakeboarding(or at least trying to learn to) is my favorite water related activity. i love to swim. it is my favorite thing to do. Fishing would be my favorite water-related activity, and aside from that, I like to just go out to the middle of a lake on my boat. The peace and quiet is unmatched. Swimming, best water activity in the heat! i love to go fishing and swimming! Love Kayaking and Water skiing! Diving and snorkeling! Although, I tried SUP yoga last summer and LOVED it! Playing with my grandsons in the little pool! My favorite water activity is swimming..swimming and more swimming. Liked and shared. I love to go fishing! But paddle boarding is definitely my favorite! I like a lot of water activities but snorkeling is my go-to. Always interesting looking for like in the ocean. I love to go fishing and wakeboarding. My favourite activity is kayaking. I love the water!! I love surfing and swimming! I love kayaking and fishing!! I love anything on the water, in the water, etc. It calms me!! Thanks so much for the amazing giveaway!!! So excited!! I love swimming & paddle boarding! My favourite water related activity is swimming. I like surf fishing, you never know what you’ll pull out. I love spending time at the Great Lakes — swimming and floating! Spending time with my family in the water, near the water, and on the water. I love canoeing and kayaking on the river close to where I live but I would love to try paddle boarding! I love swimming and paddleboarding! My favorite is kayaking and I am really hoping to get into paddle boarding! I just learned how to kayak & love it! SUP is next!